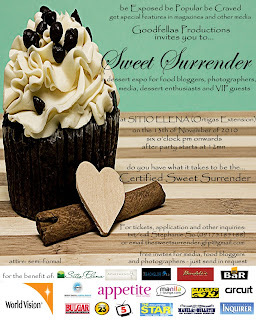 Sweet Surrender Dessert Expo ~ Philippine Freebies, Promos, Contests and MORE! Now here is an event to sink your tooth into. Goodfellas is inviting bloggers, photographers, media, dessert enthusiasts and VIP guests to The Sweet Surrender Dessert Expo slated this November 13, 2010 (Saturday) at Sitio Elena Events Place (Ortigas Extension). Be in dessert heaven as you go around and taste a wide selection of desserts from different establishments. Enjoy buffet dinner, overflowing drinks from Bardeli's, music and entertainment and unlimited use of photo booths. Bloggers and photographers can get FREE invites (with buffet food and drinks). Regular tickets are sold at P1,200 complete with buffet dinner and drinks. Dessert lovers can also get free invitations by making direct and successful referrals. Refer or sell 3 and get 1 ticket FREE. You can also get 20% off on Pre-Sold Tickets. This includes a buffet dinner, drinks, dessert tasting and use of Photobooth. So you want to win tickets? I'm making it simple this time! On your personal wall, write: "I'd like to go with @Boy Kuripot to attend the @The Sweet Surrender event on November 13, 2010 to sample desserts galore"
Link this blog post as a link to your wall post. After writing the text above, click the "Link" icon and paste the URL of this post (http://boy-kuripot.blogspot.com/2010/11/sweet-surrender-dessert-expo.html) then choose any picture on this post. 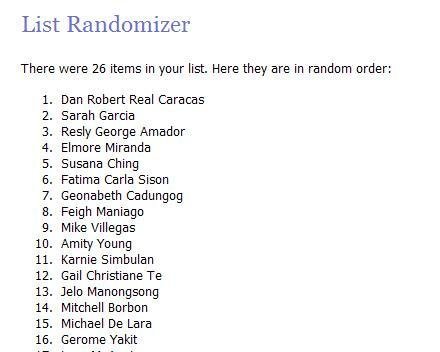 Congratulations to the 10 winners who will get 1 invite EACH to attend the Sweet Surrender Dessert Expo. Please check your Facebook Inbox for instruction on how to claim your tickets.